For the foodie on your holiday list — or just people who might appreciate a good tequila or pie pan — here are some great gift ideas. For the foodie on your holiday list — or just people who might appreciate a good tequila or pie pan — we offer a gift guide. It’s got coffee machines, books, chocolate truffles and a fabulous tote to carry it all away. Opinel is an iconic French knife maker. They are recognized and famous for their picnic “pocket” knife which is made the same way today as it was in 1890 when Joseph Opinel invented it. 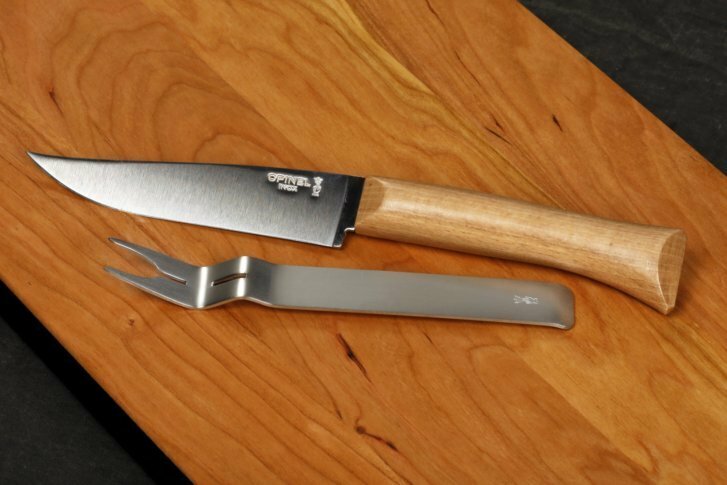 This compact set of an interlocking fork and cheese knife is made from stainless steel and a blond beech-wood handle. The set of two is perfect for anyone who entertains and loves cheese_which pretty much means all of us! If you are a fan of cheese and charcuterie boards, this JK Adams Cherry Cheese Server is a must have. JK Adams is located in Dorset, VT, and has been making high-quality wood products for 72 years. The cheese server is beautifully made from a solid piece of cherry wood and sports handles on either side for easy transport. The burnished edges give it a more finished look and the teak oil finish brings out the natural beauty of the wood. A gift giving plus is that the board can be personalized with either initials or a custom message for a small upcharge. This is a great holiday gift and a special way to commemorate a milestone. The best thing about these triangle mini-server cast iron dishes from Lodge is that they are pre-seasoned and_hold your hat_dishwasher safe! But besides that, I love the triangular shape that lets you fit this dish into small spaces on a table. Finally, you can have lots of little dishes filled with nibbles and not be concerned that your dishes are too big for your bar or coffee table. They are also oven-safe as all cast iron is, and you can bake the cutest individual wedges of cornbread, cobblers, pie, pot pies or cornbread-topped chili. Because each dish is triangular, you can bake the individual portions and present them in all kinds of shapes. Cristel, made in France and designed by a former Peugeot car engineer, is sleek and functional. The heavy-duty stainless-steel cookware is tailor-made for conserving space and small kitchens with detachable handles, and pots and pans that nest inside each other. The handles are removable, and also come in fun colors (those are sold separately). More importantly, Cristel performs masterfully. The bottom of every piece has a thick base of heat-conducting metal that works on any stove including induction. This is the best stainless-steel cookware that I have used. You would think all this comes with a steep price tag. And you would be right, except that now Cristel is making a new collection exclusively for Home Depot. The collection is charmingly called “Tulipe” referring to the slight outer curve on the bottom of the pan. First introduced in 1995, Selection Suprema is reported to be the first extra-anejo or “extra aged” tequila in the industry. It is distilled twice and aged in American white oak barrels for four years before being bottled. When you pour the extra anejo into the glass, you first notice the deep amber color that is produced naturally_no caramel coloring is added. Next, you smell a floral freshness and caramelized sugars from the cooked agave. Finally, you taste the soft, round, rich flavors of vanilla and dried fruit with a spicy finish. This complex extra-aged tequila will appeal to any fan of smooth high-end brown spirits. Paradiso is a mash up of Mexican tequila production and French cognac blending. The herbal nose gives way to scents of caramel and butterscotch, and the flavor is sweet and oaky with a smooth elegant finish that you would expect from tequila that has been aged for five years in cognac barrels. This is a tequila that you want to sip on after dinner or on a cozy day when time is on your side. Volcan De Mi Tierra (a.k.a. land of volcano) is one of the newest members of the super-premium tequila club. Born at the foot of the Tequila volcano, the volcanic land provides rich soil and a sense of history for this new brand. The distillery combines old-world traditions with contemporary technique and mixes 75 percent slow-roasted lowlands agave with 25 percent highlands agave. The mixture is distilled twice, once in a copper still, and once in a stainless-steel still where it rests for a month before being bottled. All that is to say, that the result is a perfectly balanced, fresh, fruity, clean and slightly floral spirit that you can sip on all night long. If you are a fan of wine and spirits, you know that George Riedel has devoted his life to creating glassware that enhances the wine and spirit. The glass is reminiscent of a champagne flute and it does make a difference both in the taste and the enjoyment of sipping tequila. This is the perfect glass to use with any sipping tequilas, or any others that you like to sip neat_no ice allowed. “Good food always has a good story and a recipe is a story like anything else,” writes Rick Bragg. And, he has captured the essence of his family’s story and the food on their table in this food memoir with recipes. The central character of the book is Rick’s momma, Margaret. The story is like peeking through the window into his family history. This is a book that will be a welcome gift for fans of Rick Bragg, working-class Southern food, and for those interested in the way life used to be when you grew and caught much of your own food. Edna Lewis (1916-2006) is an almost mythical food figure and had always seemed somewhat intangible to me. Described as elegant by everyone who knew her, she was born and raised in Freetown, Virginia, in a self-sustaining farming community of emancipated slaves_this is the food and the life that is reflected in her most acclaimed books. This book of essays helps to anchor her contributions to American, and more specifically regional southern foodways. The book, compiled and edited by Sara B. Franklin, provides stories and insights from people who knew her and/or people who have been captivated by her writing and researched her. If you are a fan of both history and Southern food, or curious about the way that seasonal foods create a culture, this book is a must. It is written in the style of an oral history with vignettes of North Carolinians who are tied to these iconic foods. They are either continuing the traditions that their forebears passed down_or remembering them with wistful nostalgia. The book is organized by month, and each month is a chapter that features one iconic North Carolina ingredient. The stories will either bring back memories or teach you something new. Pretty much everyone loves pie, and this is the season for pie. But many pies need to be baked twice and that is a deterrent for even the most patient bakers. Blind-baking pre-bakes the crust so that it is not a mushy mess in the bottom of the pan, under the filling. But now, you can bake pies on the Baking Steel and eliminate the need to pre-bake your crust. Made from low-carbon steel, Andris Lagsdin created the baking steel because he wanted to make a better pizza without building a wood-fire oven. You preheat the oven with the steel inside for an hour before baking and then place your pie plate directly on the Baking Steel— if you are baking a fruit pie or a pie that might overflow while baking, I would put a piece of parchment paper or foil on the Baking Steel just to make the clean-up easier. You can also bake pizza and bread directly on the Baking Steel and, you can use it on your grill as well. If you bake, you probably collect baking pans. Many of my favorite pans are made by Revol. Revol is the creator of the original French porcelain and makes bakeware, serving pieces and even coffee cups that are both beautiful, functional and easy to clean. This 9-inch porcelain pie dish from Revol is the perfect pie-pan upgrade for your favorite baker. This is a perfect pie pan because it is 9 inches wide and a perfect 1.5 inches deep. The cream-colored culinary porcelain pie dish comes in a gift box that is so durable that I use it to store my pie pan. Jan Hammock created the pie/cake/food carriers in honor of her southern mother Millie and her aunt Lottie_thus the name of the company. She carried food all of her life to dinners, potlucks and the like and finally in 2015 made a better food carrier for herself. She combined the southern tradition of wrapping food in a tea towel with the prettier ornamental tradition of Japanese Furoshiki, the centuries-old tradition of wrapping objects in fabric. It is a beautiful way to present a gift or carry food. It is also an easy “bag” to keep in your car or purse for trips to the farmers market and other shopping excursions. The fabric also conforms to the shape of the dish instead of the other way around. Years ago, espresso machines were cumbersome and messy but that all changed with the coffee pod, or capsules as Illy calls them. In honor of the 20th anniversary of the Francis Francis X1 machine, a special edition multi-beverage machine was designed. Now you can make espresso, cappuccino, regular coffee and lattes at home with one machine. Two types of capsules are available for the machine; one for espresso and one for brewed coffee. Both capsules comes in medium roast and dark roast. Espresso is also available in decaf, long espresso and three single origin varietals. These days, cold brew is better known as the ultimate iced coffee and loved because it is less acidic, and has a sweeter more citrusy quality. It also never tastes burnt. There are a lot of cold brew gadgets out there but most of them address the filtering process and don’t cut down on the time it takes to make. The Cuisinart Cold Brew Machine is an exception. In 45 minutes, it extracts all the flavor from the ground coffee and you have iced coffee ready when you are. If you like a lighter coffee, it will take even less time. For comparison, the refrigerator method generally takes 12-24 hours. The machine looks like a traditional coffee maker, and has three separate filters which reduce the mess and the grittiness of the old-fashioned method. Hebel & Co.’s chocolate halva is created with chocolate lovers in mind and it fully compliments the tahini. Robust 70 percent cocoa chocolate ribbons through the tahini base and is so full of flavor that you taste chocolate first and sesame second. My favorite thing about the candy is that before it melts into a creamy confection, there is a whisper of a crunch as you bite into it and that flakiness gives you an appealing texture before it melts in your mouth and ends with the most delicious, almost savory flavor. It is the definition of balance_sweet, savory, full of texture. Just right. If anyone could make a delicious vegan chocolate that didn’t trade down in any respect to quality, flavor or texture, it is La Maison du Chocolat. The box comes with a beautiful color brochure that guides you through each fruit-infused chocolate as you sample them. The “Grenade” pomegranate literally tastes like pomegranate seeds bursting with fresh juice ending with a tart finish. The Mango Curcuma mixes mango and turmeric in a softer way with hints of mango, and turmeric but more dark chocolate forward. Other flavors in the box are Praline Squash Seeds, Green Apple Aloe Vera and Peach Propolis_and all are pure luxury. The chocolates are all gluten-free, dairy-free, and sugar-free. The flavors of Milene Jardine Chocolates are each influenced by a favorite place visited by its creator, for whom the chocolate company is named. The truffles are delicate and well-designed with the silkiest center textures. The combination of flavors tell a story but even if you don’t know the story, you will enjoy the chocolates. The 5-piece collection is a great gift and a nice way to be introduced to Milene Jardine. When you open the box, you first encounter a folded paper program that explains the flavors, their origins and their inspirations. For example, the Harvey Wallbanger flavor is a tribute to her grandfather’s Harvey Wallbanger cake, and their home in New York City.